The Work of Wind took over a Mississauga industrial park for 10 days this September. Get a closer look at three of its projects. Feel like spending an entire summer day walking around cement plants and oil refineries? Yeah, we're guessing that's a no. But as the setting for an art exhibition about our impact on the environment, it's one incredible way of driving home the message, making it harder to ignore than a thousand-foot smokestack. Last month, a project called The Work of Wind: Air, Land, Sea grabbed the attention of CBC Arts. An outdoor art show curated by Christine Shaw at the University of Toronto Mississauga's Blackwood Gallery, The Work of Wind was the biggest project of its kind to ever hit that sprawling hydra of a city (comprising 22 neighbourhoods, Mississauga is one of the most populous suburbs in the world). And for 10 days in September, 13 site-specific art installations were dropped in Clarkson's Southdown Industrial Area, an exhibition site that covered roughly 1.5 square kilometres of grass and asphalt. Whether visitors explored the zone on foot or on bikes, by bus or (somewhat ironically) by car, they'd be wandering past a wastewater treatment plant, a carbon dioxide production facility, an oil and lubricants refinery, with more ordinary signs of suburban life bordering the site to the north and south — a family-friendly park along the lakeshore, for instance, and the strip malls of Royal Windsor Drive. It was one unavoidable value-add to the projects themselves, art that largely aimed to prod people into thinking about climate change and the future — a conversation the spot itself kind of suggests. Here, you've got industry's effect on the landscape all around you — but in five minutes you could be at the town roller rink, skating around as if none of it were there. In these three short docs by Toronto filmmakers Istoica (Jess Hayes and Arnika Tamatoa), get a closer look at the exhibition. Each video pulls focus on a different project that appeared at The Work of Wind. It takes a a village to raise a hot air balloon. That's one of the takeaways from this video about Saraceno's The Work of Wind project, "Museo Aero Solar." Using thousands of plastic shopping bags and the help of community volunteers, the Argentinean artist brought his floating "museum" to The Work of Wind — an art installation capable of flying into the sky, so long as the weather's just right. To rise, the balloon needs to be heated by the summer sun, and in high wind, its patchwork construction is susceptible to tears. So when our filmmakers visited the site, the "Museo" crew was struggling to harness the elements. As The Work of Wind curator Christine Shaw points out in the video, 21 communities have previously collaborated with the Saraceno on the project. And together, they're part of an ongoing global conversation about climate change, fossil fuels and plastic pollution. As she puts it: "It's a global issue happening in a local context." Further up Southdown Road, "Observatory for Riparian Repose" was another project powered by environmental forces. The towering sculpture is modelled after a bâdgir, or windcatcher — a sort of ancient A/C unit that originated in Iran. In the video, artists Akhbari and Kalmenson explain the nuts and bolts of how their windcatcher works, while also revealing how a legend about madness and invention inspired the project. Most of the video, however, lets you explore this meditative work of art, as the camera gazes at the rippling, natural light projections that are generated by the piece. As Kalmenson puts it: "I feel like I'm in an eternally lazy summer day." Fight. Thrash. Water. Claim. Those four words would have been visible to anyone walking along the lakeshore towards "The Liberation of the Chinook Wind," a project from Secwépemc artist Tania Willard. Emblazoned on colourful windsocks, the flags don't just reference a multitude of topics — the fight against climate change, extinction, Indigenous claims to traditional land and waters — but they also serve a function, one that becomes apparent once you reach the site. The project lets the wind write actual poetry. 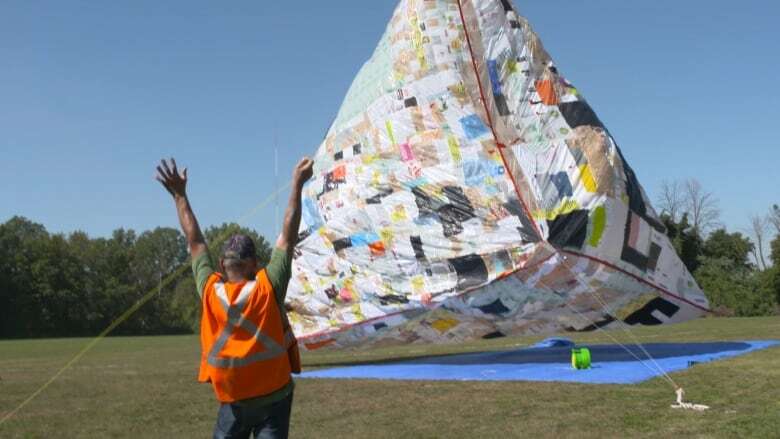 Willard worked in collaboration with the Institute of Communication, Culture, Information and Technology at the University of Toronto Mississauga to create a data visualization generated by those high-flying windsocks. The poetry was projected inside a nearby shipping container. Says Willard: "If the wind can write poetry, then what is the wind saying to us at other times? Can we listen to the wind going through the leaves of that tee and understand a language, understand a poem, understand a prophecy?"